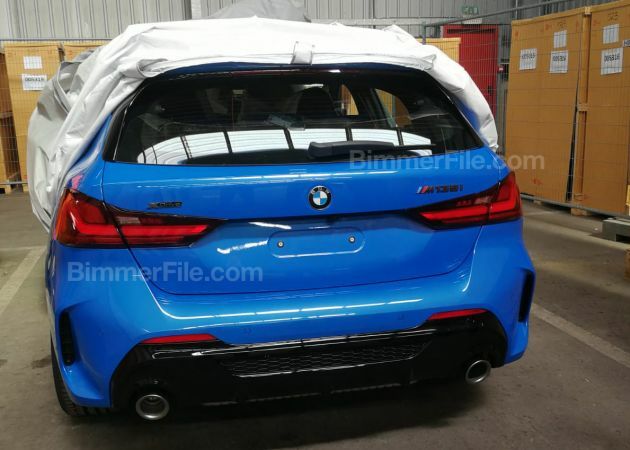 What you’re looking at here is an undisguised example of the next-generation F40 BMW 1 Series, which as many of you know should know by now, will be based on the FAAR (Frontantriebsarchitektur, or front-wheel drive architecture) platform. Shocker. This particular car is apparently the zippy M135i xDrive, which should be the range-topping variant in the F40 line-up, replacing the rear-wheel drive M140i. Based on information supplied by BMW previously, the M135i packs a 2.0 litre turbocharged four-cylinder engine with 302 hp (306 PS) on tap. By making an educated guess, the engine is likely the enhanced version of the B48 mill, which is currently being used in the X2 M35i xDrive. An eight-speed Steptronic automatic transmission should be the only transmission option available, and all-wheel drive will come as standard. According to reports, the powertrain will also feature a front-mounted M Sport differential. The new 1 Series will also come with actuator contiguous wheel slip limitation, or ARB, a feature adapted from the electric i3s. The system integrates the traction control system within the ECU rather than the stability control system, resulting in shorter signal paths. This allows information to be passed on three times faster, while the regulation speed perceived by the driver is up to ten times faster. 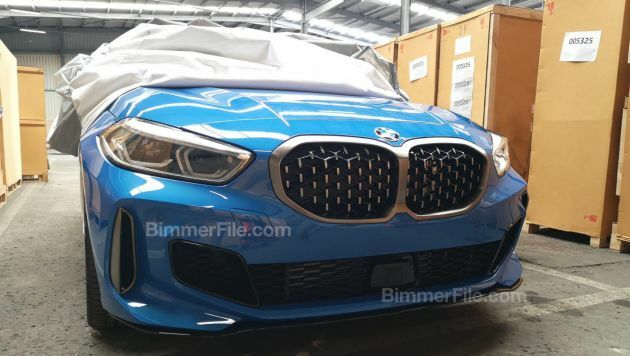 With the new platform, the 1 Series sees significant revisions to its exterior, which are clearly seen in these photos from Bimmerfile. At the front, you’ll find linked and rather thick kidney grilles finished in satin silver, which feature the same pin-style mesh pattern as that on the G20 M340i xDrive. A large set of headlamps flank said grille, while the lower apron sports a wide intake aperture divided into sections, as well as vertical slits that help channel air into the front wheel arches. Around the back, there’s an air of the latest 3 Series if you discount the upright rear glass. Highlights include L-shaped graphics within the taillights, dual exhausts, a gloss black lower “diffuser” and non-functional outlets at the sides of the bumper. The switch to a front-wheel drive layout, a new platform and a larger exterior serves one purpose, providing more interior space. BMW says its new 1 Series offers 33 mm more rear legroom and 19 mm more headroom, while the boot is 20 litres larger than before, now measuring 380 litres. The 1 Series won’t be the only front-wheel drive mode coming from BMW either, as the hatchback will be joined by the 2 Series Gran Coupe later on. The four-door coupe is aimed at those looking for a more stylish alternative to the 1 Series Sedan. Why does that back keep reminding me of the old E84 X1? But front got that pedophilic grin to it…. No more 1-series rear wheel drive in the future… Quickly buy up the last generation of 1-series RWD which currently on sale.. So this is the blue version of Angry Bird piglets? wa that bling bling-esque/diamond grille follow A-class grille design? BMW Malaysia better bring this in. It’s the Golf R/A35 rival. The hot hatch segment is going to be competitive. As for the vanilla version one would expect the base 118i with the 1.5l engine and I hope to see a 125i with the 2.0l engine to compete with the A200/250 duo but with CKD to boot so prices will be a lot better than what MBM is offering. Next Post: 2020 Mercedes-Benz GLS – full-sized X7 rival leaked!